The detail is mind boggling. 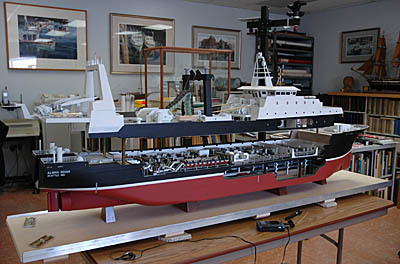 And the engineering, craftsmanship, and design are just what one would expect from maritime historian and ship modeler Erik Ronnberg, Jr. He called a few months ago to invite me up to Rockport to see a model he has been working on for the past two years. The Smithsonian Institution commissioned Ronnberg to design and build a Pacific Coast factory trawler. 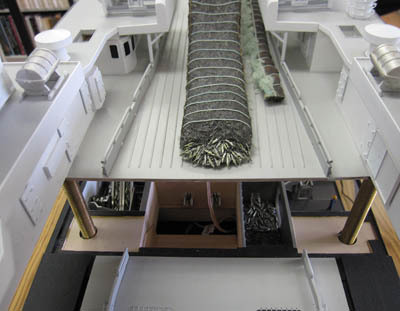 The piece is an incredible rendering of a working factory trawler, with exacting detail. Though the hull is made of very thin wood, the majority of pieces are cast out of metal. She is modeled after the real ship ” Alaska Ocean,” which routinely catches and processes 50-100 tons of Alaska pollock in a single haul. Every fish that comes onto the factory deck is weighed and measured to ensure that the ship doesn’t exceed her quota. Once the fish are released, they spill out into one of three holding tanks. A conveyer belt brings fish to their ultimate fate, where they end up as packaged and frozen surimi (imitation crab/lobster), rectangular fillets, or highly profitable roe. 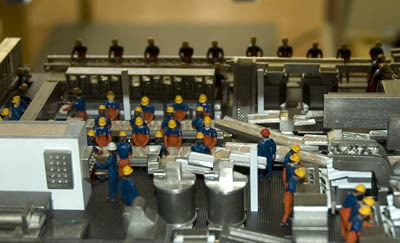 The majority of the work on the processing deck is automated. 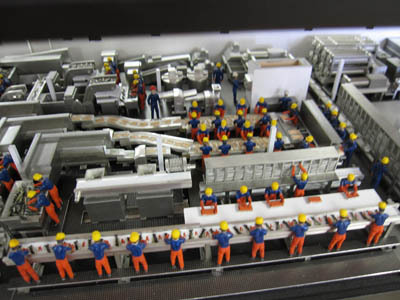 Erik has machined parts to represent the many processes that take place on this factory-on-waves: sorting, scaling, skinning, filleting, gutting, deboning, washing, cooking, compacting, freezing, bagging, loading, and storing. Examining the many fish processing stages, you can see where the infatuation with technology comes from. The model is six feet long (scale: 3/16 in. = 1 foot) and is part of the new exhibit, On the Water: Stories from Maritime America, which opened May 22 at the Smithsonian’s American History Museum. Erik Ronnberg’s hope is that a few kids will see his model of Alaska Ocean and out of that will come the next generation of naval architects.